Around this time last year, I wrote a short commentary on a London-based event that aims to commemorate the Day of Knowledge (يوم العلم). The 16th of April is Algeria’s official day for celebrating science and knowledge in memory of Sheikh Abdelhamid Ibn Badis, the leader of the reformist movement that led a relentless struggle against the french colonial assault on Algerian identity and heritage. The day of knowledge event in London aimed to bring together Algerian academics, scientists and researchers for a day to share knowledge and debate Algerian affairs. The way in which the Algerian authorities had managed to assimilate this otherwise commendable initiative is appalling. The day of knowledge event in London went from being independently organised in its first edition, stemming from the Algerian scientific community in the UK and led by the Algerian Competences Association, to being fully sponsored and hosted by the Algerian embassy at the embassy’s facilities in its third edition. 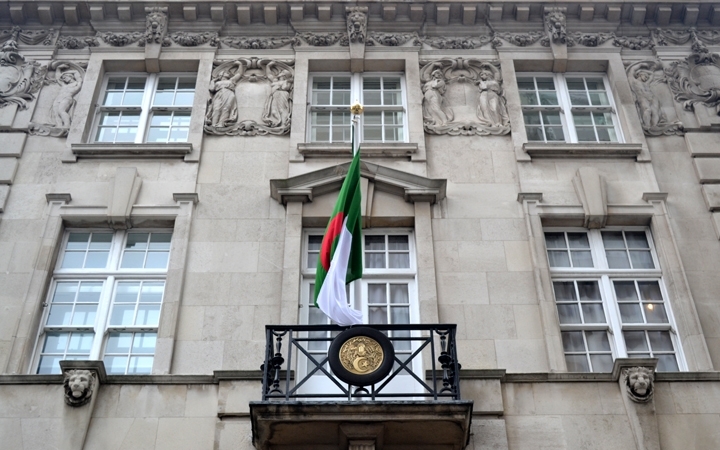 Since writing that article, a number of people got in touch to point out, amongst other things, that the commentary made false accusations and that the Algerian community’s “right” to make use of the facilities provided by the embassy should not be contested (see for example the comments section of the article). The issues of concern are, however, far more significant than any material convenience that could be gained from associating this event with the embassy. The manner in which the event was assimilated is a clear example of how Algerian authorities attempt to co-opt the community of Algerian scientists and researchers, which could only weaken it in the long run. One year on, it is interesting to observe what has been made of this event. The short answer is: nothing. The event seems to have been discontinued. Like everything else in Algeria, the authorities’ priorities are elsewhere, at least until the 17th of April and further notice thereon. There is indeed no sign whatsoever that the embassy plans to ensure the event it now controls continues to run in its fourth edition. At least not as far as I am aware. The embassy has thus took control over an event by making it dependent on its sponsorship and assets to then stack it at the lower end of its priorities and effectively deny a growing community what many considered to be a unique opportunity for exchange and engagement. Actions speak louder than words indeed. This active marginalisation of the community of Algerian researchers in the UK by the embassy stands in striking contradiction with the declarations made just yesterday by president Bouteflika (in a letter that was read out on national television and published on newspapers) on the occasion of the day of knowledge where he so eloquently glorifies knowledge and calls for the valorisation of Algeria’s competences abroad. A desperate stunt in a proxy campaign clearly gone wrong on the eve of the masquerade that is the Algerian presidential elections. One year on, as evidenced by the discontinuity of this event, the Algerian community of academics, scientists and researchers should continue to be wary of associating itself with representatives of a system that is simply not interested in truly engaging with it. Not least given its appalling record in terms of its dealings with the people’s concerns and safeguarding the country’s sovereignty in the past year [read 15 years and beyond]. While everything comes to a halt and priorities get demystified, the memory of Sheikh Ibn Badis lives on. The community of Algerian academics, scientists and researchers remains equally eager to take on opportunities to come together and positively engage with one another. The Algerian Network for Academics Scientists and Researchers (anasr.org), just like last year, is currently in the process of finalising the peer reviews of candidate papers that made it to the last stages of the 2014 Algerian Paper of the Year Awards competition; an independent initiative to celebrate the achievements of Algerian scientists and researchers and to promote excellence in academic publishing. And just like last year, the awards initiative continues to place great emphasis on celebrating science emanating from Algeria through a process of nomination, shortlisting and peer review that fully engages the wider community of Algerian scientists and researchers in and out of the country. During this symbolic month, anasr.org will be holding a networking event where winners of this year’s edition of the awards will be announced. The event will also include a series of short presentations in a number of research areas and will therefore be an opportunity to discover on-going research conducted by fellow Algerian scientists and researchers here in the UK as well as to connect with colleagues in Algeria. Please do join us in an afternoon of open debate that will stretch across borders and hopefully build bridges between peers. Come to London or tune in the live internet stream, spread the word, or better still, join anasr.org and help discover, share and inspire Algerian intellect. anasr.org is open to every Algerian academic, scientist or researcher willing to get involved and help contribute to the promotion of a culture of scientific excellence, academic rigour and active engagement that will ultimately help build paths towards a prosperous future for Algeria. This, we at anasr.org believe, is an endeavour that must develop organically from within the community rather than be simply handed down to us from official institutions.